Lex O’brien Celebrates 25 Years at Bob’s BMW! 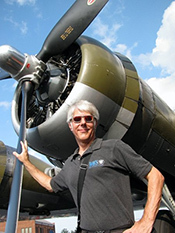 “Lex joined Bob’s when it was still Bob’s Used Parts in 1989, we were just 7 years old! Lex back in the good old days. Lex was with us in the old shop across the street selling new and used parts. Lex was one of our parts experts and even back then he helped to guide the face of customer service. Lex eventually shared the tiny office on the second floor with Suzanne designing our ads. Lex was with us when we got our Maryland Dealers License to sell used motorcycles. 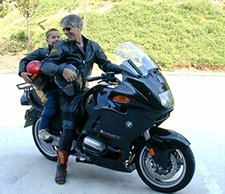 Lex was here when we first became an Authorized BMW Motorcycle dealer. 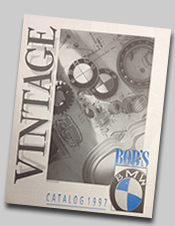 Vintage Bob’s BMW catalog designed by Lex O’brien. Lex created our first amazing catalog plus several updated versions -7 in total I believe and all works of art. Lex had two little kids when he first worked with us, we watched them grow up and one became an early catalog model. 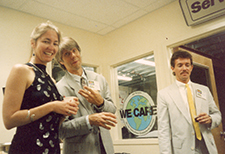 There was no internet in 1989, but when this came to be—Lex pioneered our website and ecommerce site. Lex continues to shepherd this constantly changing development process. Lex helped as we expanded and moved our facility to where we are now, I’m confident he schlepped a few tons personally. Lex has helped us grow, helped us change, and helped us evolve this business. Lex has another little kid now whom we also might get to watch grow up, perhaps this one is a future website model? Lex at an event for Bob’s BMW. Lex in the original showroom. Lex with his son Tucker. Those of you who have had the pleasure of interacting with Lex over these past 25 years, know everything mentioned above plus more is all true about Lex…he is a true asset to Bob’s BMW and one we hope to celebrate again and again in the future! So who will be next to celebrate 25 years at Bob’s BMW?! Could it possibly be one of the newest members to our team such as Azure Carr or Stephanie Moreno, our new Certified Apparel Specialists? Or perhaps Tony Rouse or Patrick Ardnt, our newest Parts, Accessories, and Apparel team members? Or maybe Jovan Saunders, our new BMW certified technician? Only time will tell! In the meantime, next time you visit Bob’s please be sure to welcome Azure, Stephanie, Tony, Patrick, and Jovan to the Bob’s family and congratulate Lex on 25 years and counting! Watch Video Tribute to Lex’s 25 Year Anniversary. Congratulations on this milestone. I became a Bob’s customer in ’89 when my wife and I moved here. During those early years you were always friendly, knowledgeable, helpful and customer-oriented. And although our paths cross rarely now that you’re not on the “front lines”, I always appreciate the instant recognition and the “hi” when I see you. You’re a consistent positive influence in a changing environment.